It may not be summer yet, but it certainly feels like it here in Colorado. The swamp cooler has come out of hiding. Heaven help us. 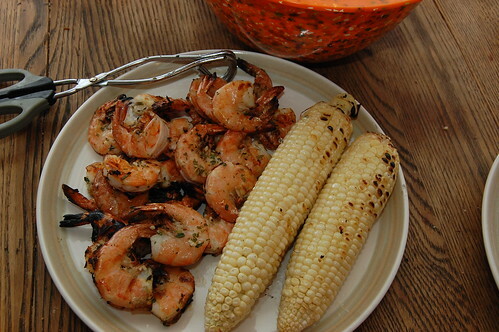 Lemon-Herb Grilled Shrimp (Thank you Everyday Food) and corn on the cob. (I know, I know, it's early for corn and no, it wasn't the best. But we had it at Rachel's house on Monday and I've been craving it ever since.) I have to say I make my favorite meals either on, or the day after, grocery shopping day. Everything is so fresh and beautiful...I've been inspired by the great stuff at the store, and we've probably been eating leftovers for the previous two days as I try to stretch our grocery bucks. 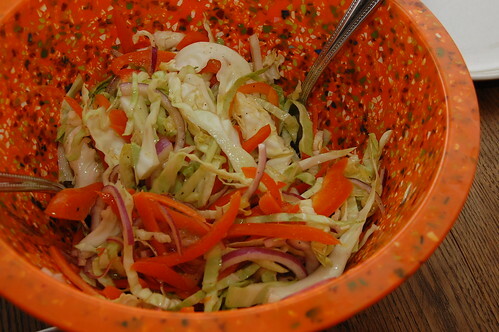 Cole slaw from the best grilling book of all time. Have I talked about this cookbook enough yet? Have you gone out and bought it yet? Well let me know when it changes your life. It feels so great to be grilling again. My grill and I have gotten to know each other very well and we have made some excellent, and some not-so-excellent food. It's usually not so excellent when I forget that he has hot/cold spots. Which reminds me...did you all know that someday I shall own a big beautiful man-grill that will have even temperature and all the amenities I could dream of? I have proven worthy of big man-grill ownership by grilling almost everyday of the summer for the last four and a half years on our little $80 getup. And when I own my man-grill I shall have you all over for steak (or something else if you're vegetarian) cooked to your desired done-ness. *Of course you should know that I won't actually get to have a new grill until we actually have jobs, maybe buy a house, possibly a new car, maybe a little in savings...but anyway, a girl can dream. Speaking of you coming over... when are you coming over? I want that shrimp NOW. My mom was extolling the virtues of your grilling book--apparently you've sold her on it. I'm going to have to look into getting it for this summer. We have a decent grill but it's now over ten years old and showing a little age. . . . I like to stroll by the man-grills on display at Costco and Sam's Club and covet just a little. That looks SO good!! I guess I need that book.